It’s important not only that your children understand the basic structures of the library, fiction, nonfiction, and the books they read, but that they can learn to read with wisdom and discernment as well. In My Book Log, we spend some time addressing theme and author worldview, and how the two relate. You'll want to read through the instructional parts with your kids, then help them apply what they've learned in the notebooking parts of their book log. The My Book Log: A Notebooking Journey will allow your kids to learn everything they need to know to really understand reading fiction and nonfiction during their elementary years. Not only that, the notebooking portion of their book log gives them a way to practice what they've learned over and over again. A Great Base for Future Literature Study! 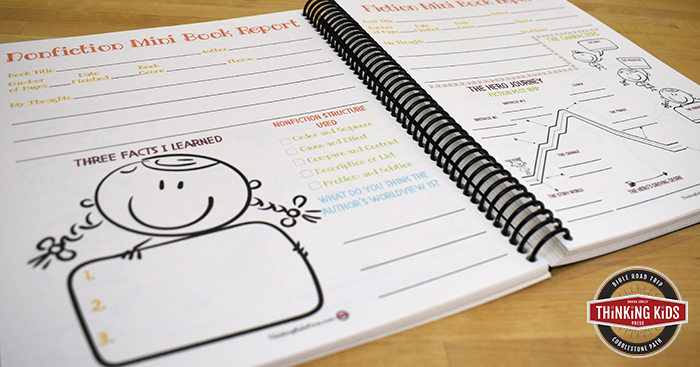 Print the My Book Log duplexed (double-sided) and have them flip on the long side. I recommend printing the My Book Log on white cardstock so the pages will be more durable with no bleed-through. Your kids can learn to explore the library with ease once they understand the Dewey Decimal System. A writer can spend his or her whole life studying fiction. Your children don’t need to study fiction at quite such an in-depth level to begin appreciating and learning from story. There are, however, some basic fiction principles your child can learn that will allow them to read fiction more discerningly. Just like fiction, nonfiction follows specific conventions and principles. It will benefit your child greatly to be able to identify and understand the nonfiction structure and its purpose. Now that your child has studied the basics of the library, fiction, and nonfiction, they’ll get down the business of keeping several forms of book logs. For fun, your child will also receive 12 printable book plates. They can cut these out and paste them into the cover of their own books for a sense of ownership. Keeping a book log has been a lot of fun for our family over the years. My boys have learned to be discerning, educated readers. I'm so excited for your family as you begin on your own book journey!